66 Ted Potter jun (South Course), Ryan Palmer (South Course). 69 Russell Knox (North Course), Justin Rose, Shane Lowry, Seamus Power. 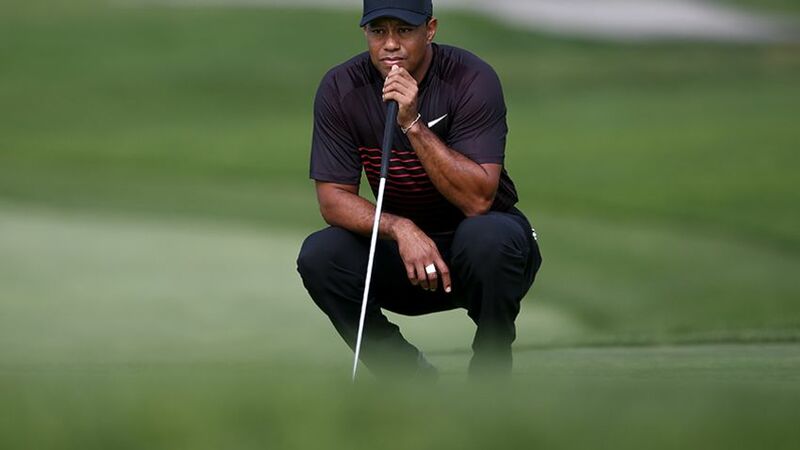 SAN DIEGO – Tiger Woods played six days per week to prepare for his 2018 US PGA Tour debut at the Farmers Insurance Open, unencumbered by the quotas that have limited his practice time over the past few years. “Now it's just, hey, want to go play 18, want to go play 36? Sure. That to me is fun,” Woods said in his pre-tournament press conference. After years of struggling with back pain, Woods has enjoyed the camaraderie of playing with his friends at his home club. Fellowship has never been Woods’ first priority on the golf course, though. A thirst for competition has driven him to 79 PGA TOUR titles and 14 majors. All the casual golf in the world can’t replace the emotions that tournament golf elicits. “I want to start feeling what it feels like to be out here and hit shots (and) grind out scores,” he said Wednesday. The first round of the Farmers Insurance Open gave him that opportunity. He played Thursday’s first 13 holes exactly how a reasonable witness to last month’s play in the Bahamas would expect. Tap-in birdies on Nos. 6 and 10 were offset by three bogeys and several pars that were saved only by deft short-game work. He seemed headed in the wrong direction toward the middle of his back nine, dropping his driver in disgust at the par-4 12th hole and making a sloppy bogey at the next hole after dumping a short wedge shot into a greenside bunker on the par-5. “I was probably a little bit rusty,” he said. The slide stopped there, though, as Woods fought to salvage an even-par 72 that kept his hopes of spending the weekend in San Diego alive. He hit his final five greens in regulation, including an impressive tee shot on the par-3 16th that was the defining highlight from his first round. Patrick Reed, his playing partner, described it as “6-iron that came out like a pitching wedge.” The shot landed softly on the green before curling within 6 inches of the hole. On the next hole, Woods choked down almost to the steel of his 7-iron, digging the ball out of the rough to hit a high cut to the elevated green. He parred the par-5 finishing hole after missing the fairway and laying up short of the pond. “It was cool to see him fight today,” said Reed, who shot 68. After hitting four greens on the front nine, Woods missed just one on the back. He hit 8 of 14 fairways while averaging 314.1 yards off the tee. He ranked 14th out of 78 players in Strokes Gained: Off-the-Tee, but was 50th in Strokes Gained: Approach-the-Green (ShotLink stats are only available on the South Course). Despite hitting two-thirds of the greens in regulation, Woods lost 0.6 strokes with his approach play because he struggled to get the ball close to the hole. Of the 12 greens he hit, just two of those approach shots ended up within 18 feet of the hole. His average proximity to the hole on greens hit was 28 feet, 6 inches, but that number was skewed lower by approach shots knocked stiff at Nos. 10 (2 feet) and 16 (1 foot). “I need to clean up my iron game for tomorrow and give myself a lot more looks at it,” Woods said. He admitted Wednesday that he is still searching for a swing that works best with his physical limitations following back-fusion surgery. “I’m still learning it,” he said. For all the gushing over the numbers he’s producing on Trackman, great golf is a product of consistency over weeks, months and years. Woods exhibited the unsteady play characteristic of a man who’s still trying to learn his swing and has played just 12 competitive rounds since 2015. He will start his second round on the North Course in a tie for 84th place. The shorter of Torrey Pines’ two courses used to play a couple shots easier than the South, but that changed last year after Tom Weiskopf’s renovation. On Thursday, the North Course was just three-tenths of a stroke easier than the South Course. Woods was 2-over par for his first five holes Thursday, looking like he was overmatched by Torrey Pines’ tougher South Course. He missed the fairway and the green on the first hole, then went bunker-to-bunker on No. 5. Then he walked after his 238-yard second shot on the par-5 sixth, two-putting for his first birdie of the day after hitting the green with a long-iron. He dumped a short-iron into a bunker from the seventh fairway, then missed the green on the short par-3 eighth hole, but saved par both times with deft short-game shots. An approach shot knocked stiff at the par-4 10th hole got him back to even par. He made an easy par at the 216-yard, par-3 11th hole before hitting a long drive on 12 that he was unhappy with and making a sloppy bogey at the next. He played the final five holes in 1 under and showed enough positive signs for him to receive passing grades for the first round. “It was fun to feel that competitive rush again and have a scorecard in my hand and try and post a number,” he said. A fighting finish gave him a score that did not damper the optimism surrounding his latest comeback. Woods, whose mobility has been hindered by his back fusion, seemed to rely primarily on fades, even on dogleg-left holes like Nos. 14 and 15. Hitting a fade didn’t decrease the distance of his drives, though. His clubhead speed was high, and his iron shots sailed higher. But for every impressive shot that harkened back to Woods’ better days, there was a miscue that reminded us that Woods has played just one official PGA TOUR event since 2015.